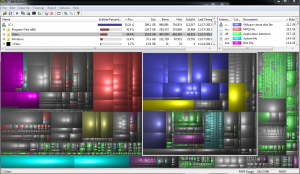 WinDirStat is a handy open-source application for scanning your hard drive and finding out what folders and files are taking up the most room. On large drives this can be time consuming and disk intensive (both things that you want to avoid on virtual environments). An alternative that has it beat for performance is WizTree. WizTree circumvents that annoying OS and digs right into your hard drive’s master file table, providing a massive performance increase over asking Windows to get statistics on all of your files. We’re looking at >23x increase in performance! 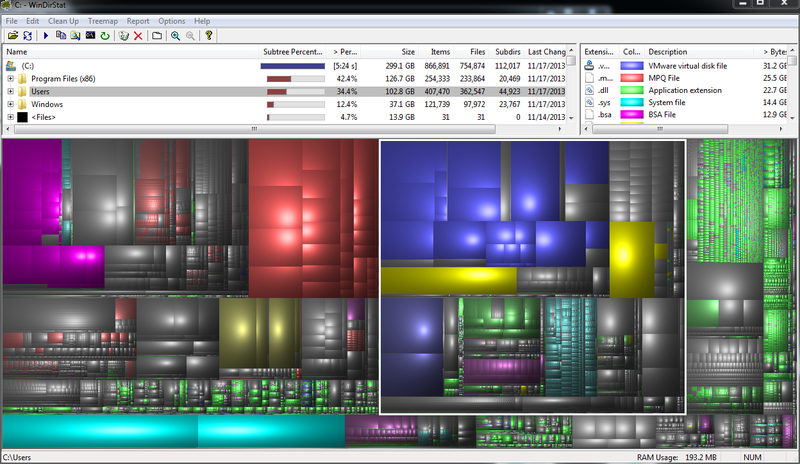 WinDirStat provides much more visually useful information, with file-type breakdown by color, selecting a file type will highlight all files of that type in the treemap. I am able to immediately notice that VMware images are currently taking up >10% of my use hard drive space, with WizTree it requires a little more digging. The only other concern I’ve seen brought up was security, of course WinDirStat is open source and available here on BitBucket, so those that are extra paranoid or worried about what “freebies” come with free software, they can download and compile it themselves. WizTree is closed source donationware, and from my first look into it, it seems clean of any kind of malware with little incentive for the creator to distribute anything iffy with it. This entry was posted in Technology and tagged WinDirStat, WizTree on November 18, 2013 by William Roush.